Philips India introduced the latest innovations in air purifiers category. Already the pioneer in the air purification segment in India, Philips has been striving to penetrate deeper into the market by offering solutions for both domestic, as well as, larger area settings. The two new products Philips Air Purifier Series 3000 and Philips Air Purifier Series 6000 launched come with Philips’ Aerasense technology that offers real time numerical PM 2.5 LED display. Aerasense is a cutting edge technology exclusive to Philips with the accuracy and performance benchmark against a professional sensor, senses and delivers superior purification against the PM2.5 and common allergens like pet dander and dust mite. While the Air Purifier Series 3000 is designed for domestic use, the Air Purifier Series 6000 is designed for set ups such as hospitals and large living rooms or offices that have a higher concentration of pollutants and need more intense cleaning. “The problem of polluted air is now a national challenge and needs immediate intervention, both at an individual level as well as a community level. It is important that we take charge of the situation and of our health. Philips is dedicated to providing innovations that help consumers do just that; make the right choices for a healthy lifestyle.The market for air purification is growing steadily and we are at the helm of it, continually reinventing our portfolio to meet the evolving needs of our consumers,”said Mr. A D A Ratnam, President, Personal Health,Philips India. The new Philips Air Purifier Series 3000 is an innovative extension to the existing air purifier portfolio which offers world-class Aerasense technology, respiratory particle feedback, a special allergen mode, new filters, improved airflow and an Aerodynamic design. The Philips Air Purifier Series 3000 provides most accurate real-time PM 2.5 feedback which helps you to monitor the air quality. A first in the industry, Philips’ Aerasense technology helps detect PM2.5 and common airborne allergens with high accuracy that can be bench marked with 15K Euro Professional sensor. It also has a special allergen mode, extremely effective in removing most common allergies. The new Nano Protect TM S3 filters remove 99.97% airborne allergens, have a bigger capacity and offer all round protection from fine particles, harmful gases, odor and must bacteria and viruses. 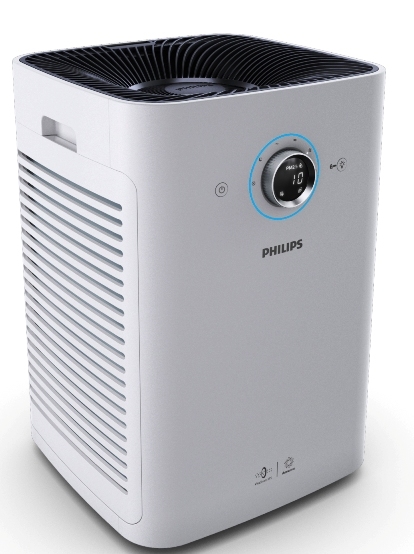 The latest Philips Air Purifier Series 6000 is a heavy duty air purifier designed for larger spaces. Indoor air pollution is not only a problem for homes, rather it affects any enclosed space. The air condition in most large spaces like offices, restaurants and not to mention places like hospitals where the allergens and microbes are present in abundance, have more inflow of pollutants; hence need a more powerful solution. The Philips Air Purifier 6000 with its with Vitashield IPS, Twin Force aerodynamics design and cutting edge Aera sense technology with real time numerical feedback, delivers superior purification against pollution and common allergens. Its TwinForce aerodynamics design effectively doubles its capacity to clean air, making it suitable for larger spaces. It also provides cleaner air with up to 8 times less chance of error in indicating air quality level is safe, compared to today's industry commonly used Infrared LED sensor with the Aera sense technology. The upgraded VitaShield technology effectively removes particles as small as 20 Nano meters (more than 100 times smaller than upper limit of PM2.5), including common allergens, bacteria and some viruses. The intuitive auto activation mode and the healthy air protect alert makes for easier usage while the 4 speed fan setting and 3 light settings help fit any need one might have. It is a powerful and highly effective solution for commercial spaces that have a high inflow of pathogens and allergens and are most susceptible to damage due to indoor air pollution. Philips Air Purifiers are available at modern retail outlets and leading retail stores. Royal Philips (NYSE: PHG, AEX: PHIA) is a leading health technology company focused on improving people’s health and enabling better outcomes across the health continuum from healthy living and prevention, to diagnosis, treatment and home care. Philips leverages advanced technology and deep clinical and consumer insights to deliver integrated solutions. The company is a leader in diagnostic imaging, image-guided therapy, patient monitoring and health informatics, as well as in consumer health and home care. Philips’ wholly owned subsidiary Philips Lighting is the global leader in lighting products, systems and services. Headquartered in the Netherlands, Philips posted 2015 sales of EUR 24.2 billion and employs approximately 104,000 employees with sales and services in more than 100 countries. News about Philips can be found at www.philips.com/newscenter.